For those that are not informed of the new addition to the math scene, Calculus BC has been recently available for study and tutoring on campus. AP Calculus AB and PreCalculus are currently the only calculus classes offered on campus. 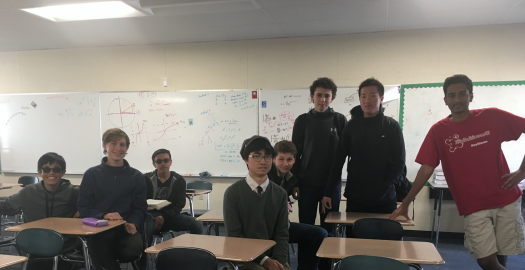 However, Jaden Kimura, a senior here at CCHS, has begun mentoring students who are interested in learning Calculus BC after school. Calculus BC is the course that follows after Calculus AB and although they are both similar in many aspects, Calculus BC is an extension of single variable calculus. Kimura mentors these students and tries his best to pace them by assigning weekly homework and routine tests. His purpose is to guide these students and motivate them to work hard enough to not only earn a 5 on the AP exam but to also have them truly grasp the concept of Calculus. Kimura self-studied Calculus BC last year as a junior and was inspired to tutor for the future junior that would also be interested in self-studying the course. He, along with a few other junior students, self-studied calculus to advance their mathematical knowledge and to challenge themselves by taking such a rigorous course. However, Kimura noticed that many of the students stopped their progression of the Calculus BC course because they didn’t have the support from a mentor to guide them and push them to continue. Due to this, Kimura didn’t want this same dilemma to prevent next year’s students from taking this course and so he decided to mentor these students. Kimura wanted to educate students to not only be “good” at Calculus BC but also because he enjoys helping others understand what they are learning and allow them to fully grasp the concepts and ideas. Recently, there was a petition flowing around the school to have Calculus BC become a class here on campus provided by CCHS. Although Kimura said he would support this petition and that the class would be convenient, he does not think it would be a necessity and personally encourages self-study more. Mr. Dien, our school’s AP Calculus teacher, implied that if there were enough funding, then there would be a class to provide Calculus BC. Although this doesn’t seem like a very challenging obstacle, there would also need to be an adequate amount of students interested. For now, Kimura is doing a great job tutoring BC and is open to mentor those that are still interested. should be for one’s self. He also wants others to understand that math is about ideas and not procedure, in which BC shows this by challenging and promoting better thinking. Currently, integration methods, polar coordinates, and parametric are the focus of what is being tutored. Kimura is also tutoring a BC only unit known as infinite series.